Alternator Belt & Pulley Tools. Masking Out Tools & Equipment. Body Shop & Trim Tools. Brake & CV Service Tools. Copper Tube & Battery Teminals. Fixings Fir Tree Number Plate. Grinding & Polishing Discs etc. Nuts Bolts Washers & Screws. Fuel Tools Injection Tank ETC. Gojak & Car Trolley's. Hex Bits & Hex Keys. Nuts Bolts & Washers ETC. Oil & Grease Service Tools. Pipe Cutters & Pipe Wrenches. Radio & Terminal Tool Sets. Sanding Disc's & Paper. Spark Plug & Ignition Tools. Spray Guns & Paintshop Tools. Thread Repair Kits & Inserts. Wheel & Hub Nut Tools. 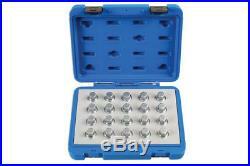 Laser Tools 6862 Locking Wheel Nut Key Set - Vauxhall/Opel 20pc. Factory fitted Locking wheel nuts are fitted as a set of 4 nuts matched to one key. Vauxhall/Opel list a total of 67 locking wheel nut keys against OEM number Z16512 for the applications listed below. Because of this it is not possible to give definitive list of model applications against any one particular key. Laser has taken the 67 locking keys and separated them by key numbers into 4 conveniently sized kits. The 6860 kit is made up of the seven keys with a 4 digit code as listed below. For 3 digit key codes please see 6861, 6862 and 6863. The OEM key numbers listed are equivalent to the key numbers shown in the original manufacturers vehicle service details and on the original wheel locking key. 20 pc set supplied in a rugged storage case. Equivalent to OEM Z16512- 121, Z16512-122 -Z16512-123, Z16512-124, Z16512-125, Z16512-126, Z16512-127, Z16512-128, Z16512-129, Z16512-130, Z16512-131, Z16512-132, Z16512-133, Z16512-134, Z16512-135, Z16512-136, Z16512-137, Z16512-138, Z16512-139, Z16512-140. Applications include: Agila, Astra F/G/H, Calibra, Corsa B/C/D, Meriva, Omega B, Signum, Speedster, Tigra A/B, Vectra B/C, Zafira A/B. Designed for use with a conventional 17mm wheel nut socket and power bar. Do not use with impact tools. For bonafide garage use only. Tool Time International is a tool supplier based in North Yorkshire, and has been an online presence since 2003. Our experience has allowed us to develop strong professional links with the top suppliers of tools in the UK, we offer the very best products from the major players in a range of industries. We cover all bases from cheaper DIY Tools to top-end industrial parts. Take a look and rest assured we will do our best to provide a one-stop shop for all your needs! We will dispatch items within 48 working hours of the order being processed. We process all order up until 2.30pm, after this time the order is processed the following day. Sadly instances of fraud are on the increase. The cost of fraud has to be passed on to all buyers in the form of higher costs. Laser Tools 5132 Split Rim 8mm 10 Point Impact Socket 1/2D. Laser Tools 5540 Tyre Valve Tool Set 3pc. Laser Tools 5133 Impact Socket - Split Rims 10mmx 10pt. Gunson G4008 Trakrite Wheel Alignment Gauge. Laser Tools 6187 Split Rim Wheel Bit 7mm x 10 Pt. Gunson 77066 Trakrite Camber Gauge. Gunson 77137 Trakrite Camber Bar. WHAT OUR CUSTOMERS ARE SAYINH ABOUT US. Laser Tools 5780 Pneumatic Fluid Extractor/Brake Bleeder. Gunson 77128 Hog Ring Pliers. Gunson G4074 Colortune Single Plug Kit. Connect 30350 Black Nylon P-Clip 4.8mm Pk 100. Laser Tools 7188 Heater Hose Disconnect Tool - Ford. Laser Tools 5956 Brake Rewind Adaptor 3/8D - Adjustable. Laser Tools 0558 Camshaft Locking Tool. Laser Tools 3576 Two Pin Wrench - VAG. The item "Laser Tools 6862 Locking Wheel Nut Key Set Vauxhall/Opel 20pc" is in sale since Wednesday, September 27, 2017. This item is in the category "Vehicle Parts & Accessories\Garage Equipment & Tools\Other Garage Equipment & Tools". The seller is "davesgaragesupplies" and is located in GB.